We all remember the Usain Bolt crash with the flower girl at the Oslo Diamond League in 2012. Or, even worse, the Gabriela Szabo – Kofi Amoah Prah crash on the long jump runway approach. Then again, who can forget the IAAF World Relay championships in 2014? With a crash on the 4x1500m relay? My Masters comeback came to an abrupt halt back in 1997 when I collided with a jogger in Lane 2. I was doing some top speed 150m, and a jogger was in Lane 2. We had yelled “Track” which is similar to “Fore” in golf… that means watch out or get out of the way. Or both. Instead of staying put, or moving out to Lane 3, this jogger moves into Lane 1, thinking he’s getting out of the way. I am running at over 10 meters per second, or 22 miles per hour, or 36 kilometers per hour! Needless to say, I collided and crashed onto the cement infield, tearing my hamstring in the process. Season over. Go hard, or go home. I went home. 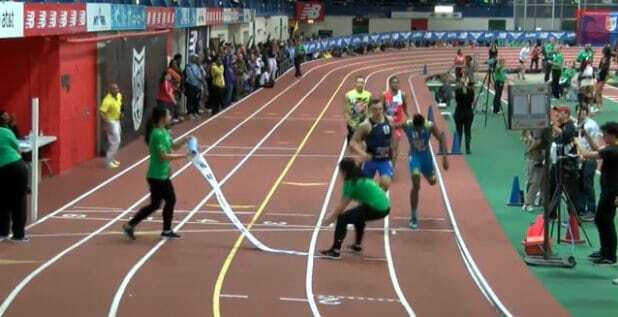 At the 2015 USA New Balance Indoor Championships, we have Taylor McLaughlin crash with the finish line tape holder. The worse outcome was Taylor McLaughlin ran a meet record of 46.50 and was later disqualified for a lane violation!